I was given this ornament as a gift and years later when a friend wanted to learn paper piecing I figured that it would make an easy first paper piecing project so I drew a pattern for a paper pieced Santa. In 2008 I created this blog page and posted a link to my pattern. Later I was told that the ornament I was given was probably made from a pattern that was in the book "Christmas Quilts and Crafts" by Eleanor Burns (c. 1995). There was some debate as to whether or not my pattern violated copyright (because I have never seen the book I certainly didn't use images or words from it, because one can't copyright a method of construction and because I used a different method of construction) but because I was told that the finished project significantly resembled the finished product in the book, and therefore could be deemed a derivative product, I decided to remove the link to my paper piece Santa pattern. 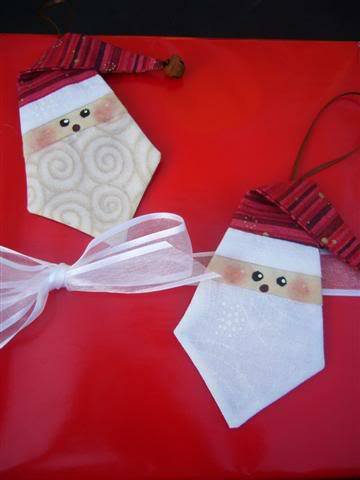 * One of my friends found that on her ornaments she could see a hint of the red background fabric through Santa's beard. Based on this she suggests that before you begin you lay your chosen white fabric on your background fabric. If the background colour shows through she suggests that you add some interfacing to your ornament. She applied iron on interfacing to the backside of Santa's beard. After you create a pattern suitable for paper piecing. 1. Place white fabric A over beard area on backside of paper pattern. (Right side up.) Remember to leave some fabric above the seam line for seam allowance. 3. 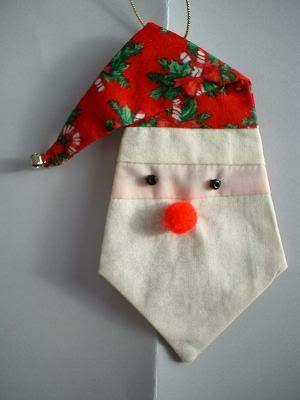 Flip over and machine sew, with tiny stitches, along line between the beard and face. Trim seam to 1/4 inch. 4. Fold peach fabric up. Press or finger press. 5. Place white fabric scrap C right side down on peach fabric and pin. 6. Flip over and machine sew, with tiny stitches, along line between face and hat band. Trim seam to 1/4 inch. 7. Fold white fabric up. Press or finger press. 8. Place red fabric D right side down on white fabric and pin. 9. Flip over and machine sew, with tiny stitches, along line between hat band and hat. Trim seam to 1/4 inch. 10. Fold up red fabric. Press or finger press. Sew on bead eyes. 11. Place face down on right side of red fabric. 12. Following the line that marks the outside edge of your pattern, cut through paper pattern and red fabric. 13. Sew around using seam line on paper pattern, leaving an opening of about one inch. Remove paper pattern. 14 Trim seams. Clip corners. Turn right side out. Press. Slip stitch to close one inch opening. 15. Attach jingle bell and nose. 16. Fold down hat and tack in place. 17. Attach cord for hanging. Here is a photo of a "gang" of Jolly Old Elves that Khristina (aka Khris) has made from this pattern. Khris's Santa's have embroidered red noses. And here are some that that talented Teresa pieced and painted. How I wish that I had a better working relationship with paint and brush! When someone first mentioned that my Santa had probably been constructed using a pattern from an Eleanor Burns book I thought that the Burns' Santa had probably been made using strip construction. In that case long strips of red, white and peach fabric would be sewn together, the backing fabric would be placed on top and then the diamond shape would be sewn through both layers. 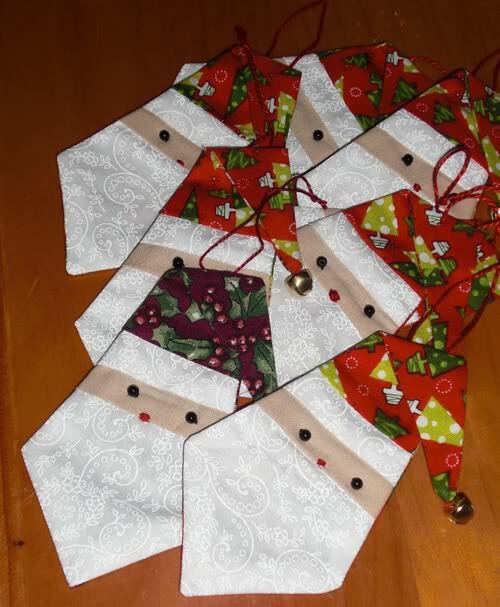 For someone making a large batch of these ornaments that would be much faster than paper piecing individual ornaments. P.S. After I was told about the possible copyright violation I deleted the blog page about this ornament. Regrettably that meant that I lost all of the comments that had been left on the page. I apologize to everyone who had taken the time to leave comments. I feel since the book was that old it shouldn't have a copyright now. For works published after 1977 the copyright lasts for the life of the author plus 70 years.